Mon. - Sat. 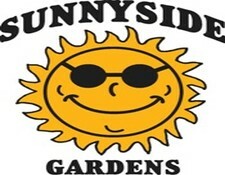 | 9 a.m. - 6 p.m.
Sunnyside Gardens is Saratoga's largest retail plant operation and garden center - we offer a huge selection of annuals, veggies, perennials as well as thousands of hanging baskets to choose from! Our employees are here to help with your growing questions. We first opened in 1982 with only 2 glasshouses. Since then we've expanded to carry the region's best selection of annuals, perennials, and hanging baskets. 90% of the flowers we sell are grown right here at Sunnyside. So by visiting us you will be supporting a great local business that gives back to the community. And don't forget our fantastic Fall Festival! Fall time brings hayrides and trainrides as well as a pick-your-own pumpkin patch. We have thousands of pumpkins to choose from! Check out our website for upcoming events icluding this areas first giant pumpkin weigh off!! We had the first pumpkin patch in the area when we began it in 1988. Since then, lots of business have copied our model and creativity but we still think we're the best around! Why not stop by for a hayride, a train ride, or some cider donuts!